In this article, we will build up on top of the basic setup from the previous article. One additional detail if you are using the pcp-zeroconf package in Red Hat Enterprise Linux 7.6: pmlogger will be configured in /etc/sysconfig/pmlogger to log metrics in 10sec steps. The default setting uf 60sec provides less granularity, but also stores less data. the "trivial" Performance Metrics Domain Agent (PMDA). I am using custom metrics for quite some purposes, for example: to monitor from which countries my website is accessed. In this article, we will modify the trivial PMDA to monitor temperature values from our system. After installation of package lm_sensors, the sensor data is available via sensors -u. Availability of the sensor data via sensors -u is not tested as part of the Red Hat Hardware certifications, so there are systems where lm_sensors is not able to access that data. In that case, you could for example try to access the temperature sensor of a hard disk, using smartctl -a /dev/sda. Red Hat Enterprise Linux 7.5 comes with PCP 3.12, where trivial is implemented in C. PCP upstream additionally includes Python and Perl implementations, which we will use. On my system, several metrics with the sensor values are available, but for our example here we will just implement a single metric: the first temperature value from the output of sensors -u. # Copyright (c) 2012,2018 Red Hat. # Copyright (c) 2008,2012 Aconex. All Rights Reserved. # Copyright (c) 2004 Silicon Graphics, Inc.  All Rights Reserved. You might be curious about the number 250 here, which we use. These numbers are used to distinguish PMDAs, kind of like Object Identifiers (OIDs) for SNMP. pminfo -m lists up the numbers in use on your system. Congratulations, your temperature value is available! We used the trivial PMDA here, if you want to monitor multiple custom values, the simple PMDA is good to start with. This is because pmlogger is not yet configured for the new metric. With this, our custom metrics get archived for future investigations. If there are issues with the pmlogger configuration, then /var/log/pcp/pmlogger/<hostname>/pmlogger.log is a good place to start further investigations. Let’s turn our numbers into graphics! At this point, multiple frameworks to generate graphics from our PCP metrics are available when accessing URL http://<ip>:44323/ of this system with a web browser. Graphite is especially interesting, it can be accessed via http://<ip>:44323/graphite . When using the search function of the graphite interface, we will notice that our metrics are presented with the hostname prepended, for example rhel7u5a.trivial.temp1 . 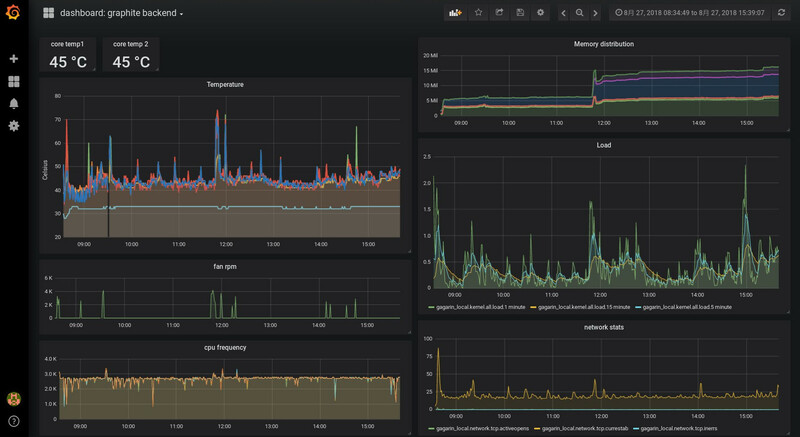 As you have seen, monitoring custom metrics with PCP is easy to setup. How are the I/O stats and temperatures of your systems varying over the day? How do they change after activating different tuned profiles? On a laptop, are temperature values different after running powertop —auto-tune? If you run multiple web servers behind a load balancer, you could now setup logging of the access statistics and verify if they receive equal numbers of accesses per second. The Performance Co-Pilot Programmer’s Guide has the details regarding PMDAs.